A Little Doctor’s Club in action in Musheerabad, Secunderabad. To decentralise and improve identification of tuberculosis patients, Andhra Pradesh and Telangana have roped in school students and trained more frontline workers with help from NGOs. I read this article and found it very interesting, thought it might be something for you. The article is called From Health Clubs In Schools To Better Diagnostics In Govt Health Centres, How Telangana And Andhra Pradesh Are Attacking TB https://www.indiaspend.com/from-health-clubs-in-schools-to-better-diagnostics-in-govt-health-centres-how-telangana-and-andhra-pradesh-are-attacking-tb/. Vijayawada/Hyderabad: In May 2016, 14-year-old Yesu from Vijayawada city was diagnosed with tuberculosis (TB). The diagnosis came about thanks to the ‘Little Doctors’ Club’ in his school, which is among 139 such health clubs being run in Andhra Pradesh and Telangana by World Vision India, a non-profit organisation, in collaboration with the respective State TB offices. Part of World Vision India’s Focused Approach towards Childhood Tuberculosis (FACT) project, these health clubs have engaged nearly 50,000 children. High school students from class 6 upwards are taught to identify symptoms of TB--weight loss, cough prolonged over two weeks, and fever. The awareness thus created is expected to enhance TB case detection and treatment success rates in schools and communities. When the health club at Yesu’s school suspected he had TB, he was referred to a government hospital for further tests. Once confirmed, Yesu informed his mother--the family’s involvement being crucial to ensuring that the tough and long treatment regime is completed--and his peers, as part of the programme’s effort to reduce the stigma associated with TB. The diagnosis, and treatment, have been tough for Yesu--both physically and emotionally. Just a few months earlier, his father, a small trader, had died of multi-drug resistant TB (MDR-TB), unable to bear the severe side effects of treatment, which he had discontinued. So when Yesu was diagnosed, his mother Jayalakshmi (they both shared only their first names) ensured that he completed his regimen. Yet, he was diagnosed with MDR-TB a few months later, meaning he had to prolong his treatment by two years. Yesu is among an estimated one million children under the age of 15 who contract TB each year, according to a report on childhood tuberculosis by The Union, which works against TB and lung disease. Nearly one in four of these children--239,000--die. An estimated 360,000 children under the age of five, who live in close proximity of family members with TB, are eligible for TB preventive therapy. The figures for India, already a high TB-burden country, are stark. In 2017, 224,000 Indian children fell ill with TB, as per World Health Organization data. Only 11% of children aged below five who had household contact with TB patients had been given TB preventive treatment, WHO data show. In Andhra Pradesh, 3% of 62,282 patients, and in Telangana, 3% of 22,897 patients who had initiated treatment in 2017 were children, as per TB India Report 2018. With an estimated one million TB patients not notified or not diagnosed in 2016-17, India must urgently find “the missing million” through active case-finding (ACF) in order to meet its ambitious goal of eliminating TB by 2025. This is why state governments such as Andhra Pradesh and Telangana are partnering with non-profits such as World Vision to improve and expand the reach of ACF. Apart from school health clubs, other decentralised initiatives such as training frontline health workers, engaging with private doctors and rural medical practitioners (RMPs) have also begun yielding results. 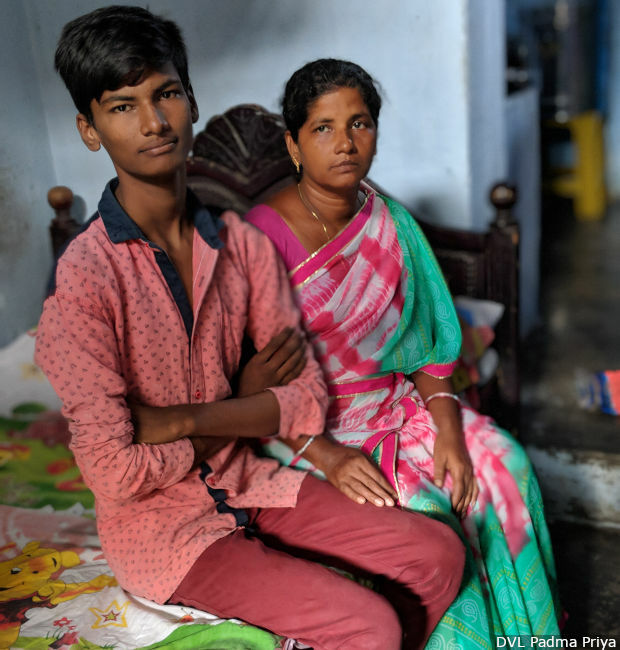 Fifteen-year-old Yesu with his mother Jayalakshmi at their house in Vijayawada. Yesu is currently undergoing treatment for multidrug resistant tuberculosis (MDR-TB). Active case-finding (ACF) is critical for early diagnosis of TB, particularly when carried out in a systematic manner among a carefully-selected target group. The Central TB Division of the Indian government requires all State TB offices/units to carry out ACF thrice a year, especially among populations identified as vulnerable, such as those living in slums and prisons. In Andhra Pradesh and Telangana, World Vision’s FACT project works in seven target units focusing on urban slums in Visakhapatnam, Vijayawada and Hyderabad. The project works in a multi-pronged manner to enhance ACF, ensure contact treatment and treatment adherence, and create awareness about the disease. As part of this project, more than 1.27 million people have been screened through ACF campaigns. The project has also trained a cadre of 1,883 volunteers as community DOTS providers. (DOTS, which stands for ‘directly-observed treatment, short course’ is the standard TB regimen used worldwide.) It has also trained 3,853 frontline workers in understanding paediatric TB, and has thus far supported 448 paediatric patients with counseling and nutrition support. 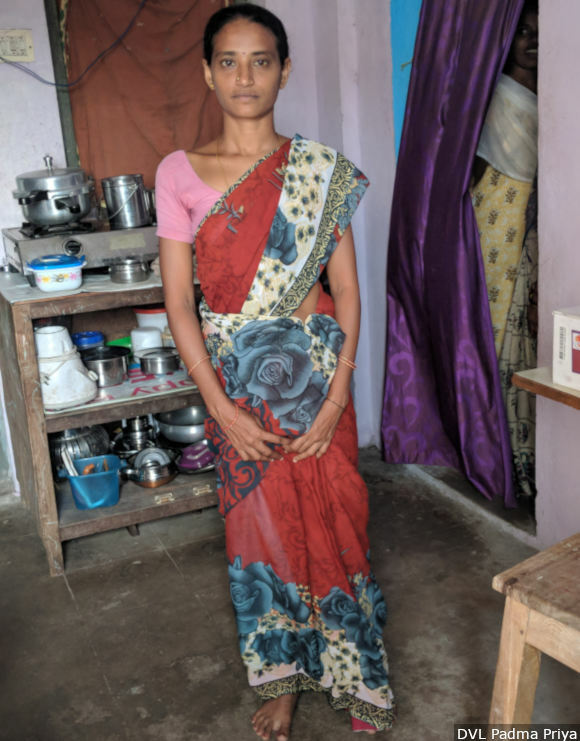 Thirty-two-year-old Kamarthi Kameswari from Vijayawada’s YSR Colony was diagnosed and treated for TB thanks to this decentralised frontline worker training. YSR Colony houses more than 200 families, most of them from economically weaker sections. Kameswari had had frequent coughs, fever and low appetite for three years. She had made repeated visits to private doctors, none of whom had had her tested for TB. She was diagnosed during an ACF campaign carried out in January 2018. By July 2018, she was declared cured. “I thought I would die because of the cough and breathlessness. I was unable to work properly and also couldn’t eat. Had I not been diagnosed and treated, I don’t know what would have happened,” she said, speaking to IndiaSpend on a warm September day at her house in Vijayawada. Her 12-year-old daughter was also immediately put on preventive treatment. Thirty-two-year-old Kameswari in her house in YSR Colony, Vijayawada, was successfully treated for TB. An eight-member ACF team helped Kameswari get the right tests done at a government hospital and start the right treatment. Members of this team also work as DOTS providers and ensure that those diagnosed complete the treatment regime. As of September 2018, this team alone had diagnosed 15 TB and MDR-TB cases from YSR Colony. Krishna district, of which Vijayawada city is a part, annually reports more than 5,000 cases from the public sector. Talking to IndiaSpend, TVSN Sastry, the district TB officer, said the addition of much-needed diagnostics facilities has helped them in not just identifying TB cases but with timely start of treatment. “In 2017 many initiatives have been taken on by the government of India. One of them is to actively and stringently look for the missing million. By adding four Cartridge-based Nucleic Acid Amplification Test (CBNAAT) machines just in Krishna district, we have enhanced our ability to test more samples and get faster diagnosis,” he said. Another strategy being deployed in the district is public-private partnership, Sastry said. In 2017, Krishna district notified 6,686 TB cases, of which 1,239 (18.5%) were from the private sector. Nationally, private notification stands at about 20% of the total reported cases; in Andhra Pradesh, it was recorded at 31% in 2017 (16,044 private-sector cases of a total of 83,118). Under a programme that aims to improve TB notification from the private healthcare sector, the TB office has identified more than 600 private doctors. These doctors are educated and encouraged to refer patients to publicly available diagnostics facilities such as CBNAAT, Drug Sensitivity Testing (DST) and liquid culture labs. Andhra Pradesh has taken this public-partnership to another level by tying up with MoIBio Diagnostics Private Limited of Goa to roll out an indigenously manufactured TB diagnostic test, TrueNat, across 42,935 centres. This test replaces the old testing method of sputum microscopy. A small and portable machine that can run on rechargeable batteries, Truenat enables early TB detection and universal drug sensitivity testing for rifampicin, one of the two most powerful first-line TB drugs. This partnership in diagnostics was recently welcomed by Stop TB Partnership, a consortium of 1,700 partners working in more than 100 countries. “As the roll-out of Truenat continues, the partnership will be closely watched not just by TB stakeholders in other Indian states but the world as a whole… If the Andhra Pradesh/Molbio partnership proves successful for the state as a cost-effective means to reduce TB, while delivering financial or reputational profit for Molbio, the hope is that it would catch on as a significant TB intervention globally,” Sreenivasan Nair, regional adviser for StopTB Partnership, said in a statement dated December 15, 2018. Andhra Pradesh and Telangana have thousands of unqualified traditional practitioners who mainly work within communities and wield trust among them. Called rural medical practitioners (RMPs), there are more than 50,000 of them in Andhra Pradesh and about 30,000 in Telangana. With a huge shortage of doctors, RMPs often work as de facto doctors in these communities but at a heavy cost for public health efforts because of their indiscriminate way of prescribing antibiotics and corticosteroids. Efforts to train and certify RMPs in both states has been met with a lukework response from the medical community. Nationwide, a plan to allow alternative doctors (or AYUSH practitioners) to practice allopathy after completing a bridge course stridently opposed by the Indian Medical Association, which represents allopathic doctors. The government finally retracted the proposal. However, those working to eliminate TB say it is essential to engage with this large community of traditional practitioners. This view has the support of World Vision India and many such organisations, who are actively working with RMPs to identify and notify TB patients. 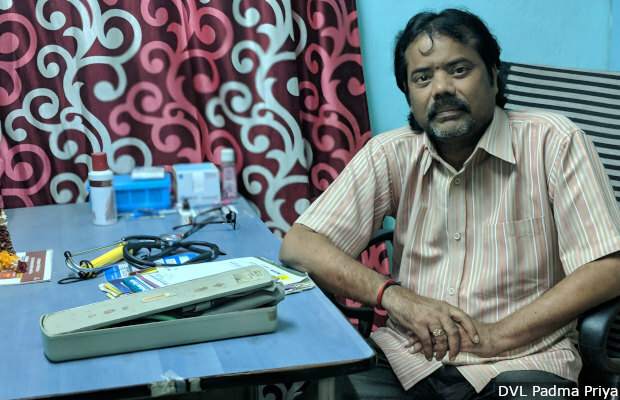 “When you train an informal provider in identifying TB, it helps as they inform the frontline health worker about symptomatic cases and the cycle of testing and treating begins promptly,” Vikas Panibatla of Hyderabad-based TB Alert, which supports the Telangana government, said. By training RMPs, treatment adherence improves and patients are saved from wrong prescriptions of antibiotics. Such de-centralised efforts go a long way, experts say. DTV Prasad has been a registered medical practitioner (RMP) for 27 years. In 2016, he was trained to identify presymptomatic TB cases. He now refers them to the local government health centre. Hyderabad district in Telangana is one of the largest with a population of more than 4.1 million. Incidentally, it is also the district with the lowest treatment initiation--in 2017, it notified 3,771 TB cases and only 42% (1,593) initiated treatment, according to India TB Report 2018. Improving primary healthcare centres (PHC), including those in urban settings, is crucial to tackling the TB crisis in India, said Dharani Kumari, a doctor who works at an urban PHC in Malkajgiri in Medchal district (part of Hyderabad city). There is also a greater push in the state to increase designated microscopy centres (DMCs) in these PHCs. DMCs help in testing the sputum samples faster so patients can be put on treatment sooner. Telangana has also embraced decentralised urban medical care by setting up hyperlocal PHCs, ‘Basti Dawakhanas’. Managed jointly by the National Health Mission and the Greater Hyderabad Municipal Corporation, these Basti Dawakhanas provide poor patients with free diagnosis and treatment, reducing patients’ out-of-pocket expenditure. In Hyderabad, it is these primary healthcare centres that are at the forefront of identifying and tackling TB. In 2015, 34-year-old Satyam from Brundavan Colony, a dhobi (washerperson), had severe bouts of cough. He approached a private doctor who diagnosed him with TB. He was put on the standard six-month anti-TB treatment. Nine months after completing the treatment, Satyam’s symptoms returned. Out of money, helpless and nearly suicidal, he approached the Malkajgiri PHC in 2017, where he was diagnosed with MDR-TB and put on treatment. “I didn’t spend any money out of my pocket for any tests or medicines. I was checked in on regularly by those working here and they also provided counseling on days when I felt very low. I am glad I shifted to the government sector,” he told IndiaSpend in September. He has one more year of treatment to complete. A robust PHC system with support from NGOs has yielded results for Medchal district, too--it has recorded a 86% treatment initiation rate among the 2,504 cases notified in the public sector in 2017. This is nearly double the rate in Hyderabad district. Apart from providing testing and treatment, the PHCs in Telangana have also been tasked with creating awareness through information and education campaigns at different levels. For Sangeeta, it was at one of these sessions that the realisation dawned that her 12-year-old daughter probably had TB. “After that session, I took her to the government clinic in Mallareddy and there she was diagnosed with TB and put on treatment,” said Sangeeta. The family were also supported with double ‘ration’ (provisions) through the Integrated Child Development Services (ICDS), a central government programme for nutritional and other support for children up to six years of age and their mothers, because of the daughter’s illness. Despite all efforts, some basic provisions of the National Strategic Plan are often not followed. The plan, for instance, proposes a Rs 1,000 incentive for every case notified by a private doctor, but this is usually not disbursed, Sastry, the Krishna district TB officer, said. Further, the Revised National Tuberculosis Control Programme (RNTCP) guidelines lay down that all children under six years who come in close contact with a TB patient should be provided with preventive treatment, even if they have not symptoms. “But this isn’t happening very effectively and there is a level of negligence in this. This needs to be prioritised and improved significantly,” said Gorremutchu of World Vision India. However, a former WHO consultant for TB in Telangana and Andhra Pradesh, Chakrapani Chatla, says that it will take more than decentralising care to make people utilise the services provided. “There are still staffing gaps at the PHC level and also in terms of availability of diagnostics' consumables. Apart from this, not all PHCs are on the same level and expected services are not available at all centres, which needs immediate strengthening,” he pointed out. He also said that while lab equipment grew in size and capacity across the states, resource limitations such as electric lines have stalled usage of these very valuable equipment. “It takes months to upgrade critical electric lines and transformers and there have been instances when a simple short circuit has resulted in damage in such expensive equipment", he added. More research is needed, he said, adding that both medical colleges and health institutes must invest in research and also motivate younger generations to do so. Some innovative steps won the Telangana government a mention in the National TB programme’s June 2018 report, States Initiatives for Patient Support Systems for TB Elimination in India. Like many other states, it provides supplementary nutrition to TB patients. However, it is the only state to utilise the Integrated Child Development Service (ICDS) scheme to provide double ration to children below the age of six years suffering from TB. Its ‘TB Care Groups’, home-based counseling services for MDR-TB patients and sensitisation of households by field staff were also praised. In particular, Telangana’s Arubah Project, which provides economic assistance to TB patients unable to re-join work post treatment, owing to physical weakness, was mentioned as a project worth emulating. For these patients, help is given in the form of vocational training, livestock, and payment of school tuitions, among other forms. Acknowledging the tough road ahead in beating the disease, A. Rajesham, state TB officer for Telangana, said public-private partnership has been key for Telangana’s success. “Apart from this, political and administrative commitment is one of the key factors for the successful implementation of the TB control programme,” he added. Back in Vijaywada, Yesu has a year more of treatment to complete, but is optimistic he will get better. He has rejoined school, too. “My school’s health club informs children regularly about tuberculosis, how it spreads, its symptoms, etc,” he said, “It has helped reduce the shame I felt for having the disease.” He hopes to apply for admission at a polytechnic college and get a job in the near future. Update: The story has been updated to clarify the quote of Chakrapani Chatla, former World Health Organization consultant for tuberculosis in Telangana and Andhra Pradesh.